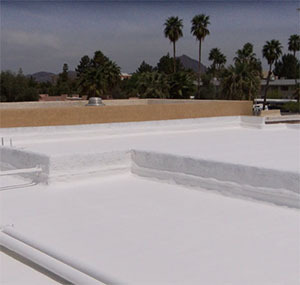 Foam roofing is a state-of-the-art roofing solution that can provide superior protection for your Phoenix home or business for decades to come. Unlike other traditional roofing choices, foam roofing requires very little maintenance and will last your whole lifetime. To get the protection that this kind of roofing offers, you need to hire a Phoenix foam roofing contractor who has the skills and training to properly apply it. 1st Class Foam Roofing is a specialist in foam roofing, and our contractors provide some of the best service and workmanship in Phoenix. Foam roofing provides seamless protection for your property because it is sprayed on as a liquid, allowing it to completely coat your roof, including every nook and cranny. When the foam dries, the hard surface provides an impenetrable defense for your home or business. The roof only needs to be resealed every few years to maintain its protective properties. 1st Class Foam Roofing has been installing new foam roofs in Phoenix for many years, and we have a reputation for superior results. In addition to our urethane foam roof services, our contractors also provide roof recoats, urethane foam insulation, concrete coatings, polyurea linings, waterproofing and walk decks. With every job we perform, we provide a free consultation to start and then offer expert recommendations based on our diagnosis of the issue. We can help with budget planning, and we also work on custom projects. We provide a proposal and contract with each job, and our work is not done until your final inspection. Call the foam roofing contractor you can trust in Phoenix. 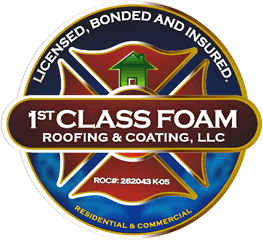 Call 1st Class Foam today to get a high-quality foam roof for your home or business or to discuss other waterproofing options for your property. We'll create a solution that offers superior protection while also saving you money. Nowadays there are different kinds of roofing materials, such as ceramic, slate, steel, concrete, and more. If you are reading this, there is a chance that you are interested about spray foam roofing as a material. You may have questions, like is foam the material that has the longest lifespan, the one that is the most durable, the one that that will preserve more the heat inside the house in winter, and so on. In Arizona, . 1st Class Foam Roofing and Coating is the professional foam roofer with permanent superior qualifications repairing and enhancing both the commercial and residential properties with roof needs. FOAM ROOFING IS WATERPROOF: Using a spray foam roofing layer on top of your roof creates the perfect waterproof layer that you need to prevent major leaks that can evolve into a house flood. Spray roofing eliminates the use of additional flashing treatments at roof edges. FOAM ROOFING IS ALSO AIRTIGHT: Spray foam as a roofing material is special, as it expands on the ceiling as soon as it is applied. This will make any roof gaps filled and sealed. 1st Class Foam Roofing and Coating considers this the most efficient way to remove any air leaks on your roof. SPRAY FOAM MAKES AN IMPROVEMENT IN COMFORT Since your new spray foam roofing eliminates your roof air leaks, combined with its protecting value, it improves your house interior by making it a space free of hot or cold spots depending on your current climatic season. NEW FOAM ROOFING REQUIRES CHEAP MAINTENANCE With spray foam roofing, you won’t have to burden yourself with sealing leaks around your roof flashings or membrane seams since spray foam roofs won’t degrade over time. You will only have to worry about replacing the UV-layer of your foam roof every five years. SPRAY ROOFING LOWERS THE COST OF YOUR HOUSE COOLING Combining an UV-layer and the insulating value of your spray foam roofing create a high reflectivity on your ceiling, which can reduce your air conditioning costs by a significant amount. It can help you lower them by up to 40%, so you can start saving money for something else that you want. A NEW SPRAY ROOFING INSTALLATION IS QUICK AND EASY Different roofing materials on the market require different applications to achieve an air sealed, waterproofed, an insulated roof. In the case of spray foam roofing, it can reach all of these in one single application. Better yet, 1st Class Foam Roofing and Coating in Arizona will complete your new spray roofing installation in a single day. Spray roofing also has the characteristic of mitigating loud noises. THERE ARE LIMITATIONS ON WHEN TO INSTALL A NEW SPRAY FOAM ROOFING Because of the spray foam material, it should not take place during wet, cold, or windy seasons. If you do a new spray foam roofing installation during this kind of weather, it can do severe damage to your foam roof. Once you install it in a more suitable season, like Autumn, and it settles, you will have the most secure roof of your neighbors. A CORRECT SPRAY FOAM ROOFING INSTALLATION REQUIRES KNOWLEDGE Even though a spray foam installation can be fast and easy to do, it requires a chemical reaction from two mixed liquids that needs a correct application and calibration. If an unskilled worker does this, there can be rough applications making the roof vulnerable to leaks. Professional foam roofers like 1st Class Foam Roofing and Coating in Arizona will take care of you roof in no time. TAKE CARE OF EVERYTHING AROUND YOUR HOUSE If you do a spray foam roof installation while having the wind around the house, the spray foam can travel and adhere to any objects near your home, so if you have anything important like a vehicle, we recommend you to keep it in a secure location until the roof installation is complete. In Arizona, 1st Class Foam Roofing and Coating in Arizona have an established team with high experience in roofing installations. We work hard to excel with our customer’s needs and concerns, so don’t hesitate to contact us with any question about our services. 1st Class Foam Roofing and Coating covers both commercial and residential fields of foam roofing, insulation, and coatings. Call 1st Class Foam Roofing today! The foam roofing contractor you can trust!